Arriving mid-week from our very long flight from Bali to Hong Kong to Los Angeles, we stayed the night at the Ritz-Carlton Marina del Rey, near LAX airport. That evening, we had an all-American dinner at the nearby The Counter where all burgers are custom-made to order then turned in early. Up at the crack of dawn from the jet lag, we all had a quick breakfast at the lounge, checked out, packed the car up with our six suitcases and set off on the four-hour road trip to Las Vegas. It was an easy drive all the way and we arrived around noon on a Thursday and spent most of the day unpacking and settling in. Our first morning in Vegas is always about having a big American breakfast and the newest place in town for that was Babycakes Cafe, located in a strip mall up the road from my sister’s place. We arrived before 10:00 a.m. on a Friday morning and the place was already packed although there still wasn’t a wait for a a table. 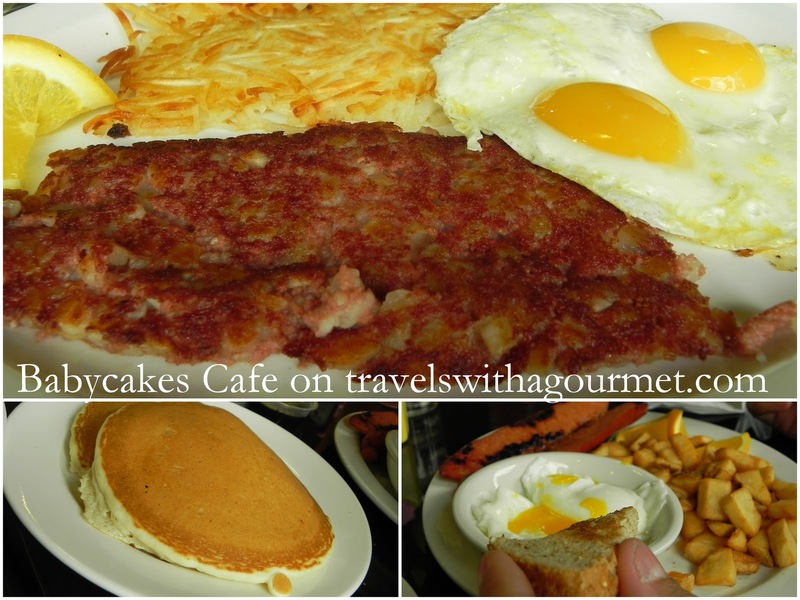 Babycakes is a small restaurant with mostly high-counter style tables and a few other small tables serving non-stop breakfast from 7:00 a.m. to 2:00 p.m. daily. The menu is large and has every breakfast you can think of. From pancakes to crepes, eggs every which way (Benedicts, omelets, scrambles) and traditional breakfast items to burgers sandwiches and salads. There is also a kid’s menu which is always convenient as the large American-style portions are just too much for the kids to eat. We started out with mugs of drip coffee while we decided what to order. The kids each had short stacks (US$ 4.50) – three fluffy buttermilk pancakes with maple syrup and side orders of crispy bacon and sausage links. A had the traditional sausage and egg breakfast (US$7.95) – poached eggs, seasoned potatoes and Portuguese linguica sausages while I chose Cora’s corned beef hash and eggs (US$10.25) – sunny-side up eggs with crispy corned beef hash and a side of potatoes. The food was good, the portions were large, as expected and the coffee was diner-style with free refills, also as expected. Babycakes Cafe isn’t serving up anything new or different – just good, fresh-cooked American breakfasts and friendly service. Open daily: Mondays to Fridays 7 a.m. to 2 p.m.
Saturdays and Sundays 7 a.m. to 3 p.m.